SemiAccurate was lucky enough to spot an unmarked prototype at the Intel booth at CES. Most people glossed over the Sony phone, but if you looked closely, you would have seen the upcoming Intel Core i7 Phone platform. This platform is a long way from release, but it features a full Core i7 system in a sleek Sony phone package. It runs Android 4.1.x at the moment, but it will be updated to the latest before release. Intel has seen the trend toward bigger screens in phones, and is leaping well ahead of this curve. To do so you need serious horsepower, and an i7 delivers the margins that Intel is craving, so the match had to happen. 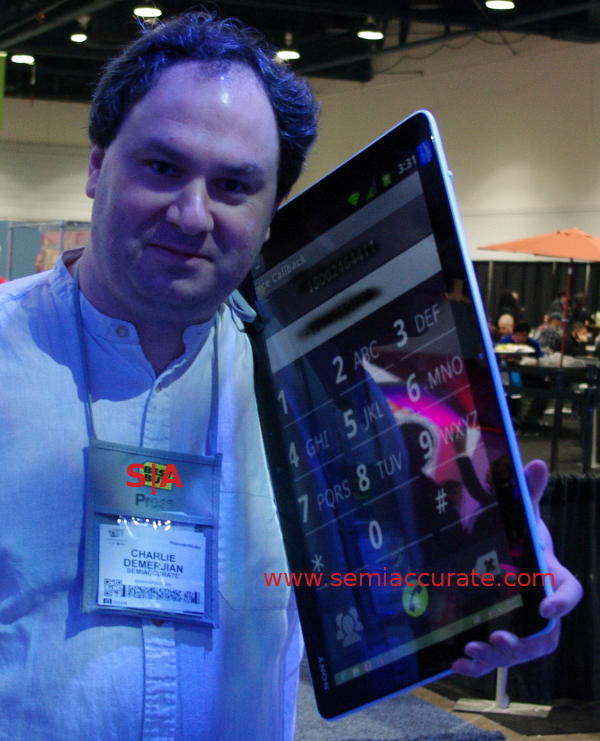 This baby is not just bigger than the Samsung toys by fractions, it is big enough to blow them into the weeds. It pack more power than any ARM device can possibly bring to bear in the next two years, but it should be available late in 2013. Yes, it has a 4-core 22nm CPU, and yes, the drivers are still broken. But the screen is big, really really big. And it is incompatible with ARM based Android apps. Luckily, it can emulate 27 ARM A9 cores with ease, so compatibility will be no problem. Sony has seen their share of the smartphone market jump from .0000004754% to .0000004761% since mid-2012, and with innovation like the Core i7 phone platform in the wings, it is sure to hit .0000004802% before the next CES. Packed with technology like the patented STIED/KABOOM (Sony Thermally Induced Early Death/explosion noise) technology, this phone can use it’s battery to spectacular effect. Was Intel purposefully deceitful at CES?